Curiosity is what made me read this book. 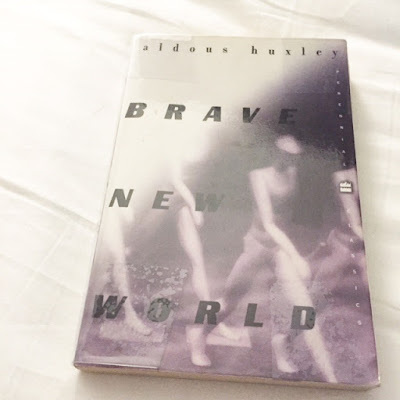 I liked the idea of a "brave new world" with genetically-engineered humans, a society made up of individuals and not families, test-tube babies, drug-induced happiness, and every manner of convenience within reach. It all sounds fascinating, doesn't it? Recently, some book club friends and I discussed speculative fiction short stories, and our conversation veered towards Huxley and this book. We talked about how genetic engineering has evolved and is being performed nowadays that you can actually get to choose your child's future traits. It came up that Huxley, through this book - originally published in 1932 - foresaw the future, how genetically-engineered embryos and test-tube babies would someday be actually, genuinely real. Indeed, less than a century after Brave New World was first published, here we are cloning animals and picking blue eyes and blond hair for our babies. Brave New World is ingenious and prophetic. Just look around at all the technology and conveniences that we've manufactured and built; the discovery of new medicines to cure previously incurable diseases, life made so much easier with the advent of machines and gadgets for communication and performing the most mundane tasks. In this novel, the everyday life as we know it now has become primitive, and only a handful of "savages" who live in a "reservation" practice this way of life. Individuals are "made" and conditioned, as embryos, to perform a specific set of tasks when they grow into adulthood, such that an Alpha, the upper-level individuals, cannot perform the menial tasks performed by a lowly Delta or Epsilon. Moreover, these individuals are trained to actually love their work; they are prepared, in all aspects, for a lifetime of doing what they were conditioned to do, and so everyone is content. The concept of a brave new world is promising, but I had a huge problem: the execution. It could have been written better. There could have been a better story. Sadly, I slugged through the narrative with a cringe every now and then, and nearing the end, I was lamenting what a total waste of a good idea it was. When I was done reading, I realized that the ingenuity of the concept got drowned out by the poor execution.